So you've decided you'd like to begin your very own art collection? Or perhaps you're contemplating the idea? Here are some pointers to get your collection going in the right direction for your cashola and enjoyment. My other article, 'How do I know what art to buy? ', gives pointers on choosing individual pieces of art. First up, $500 a year is enough to begin a collection. Yes. So if you think you can't afford your own art collection you're probably wrong. 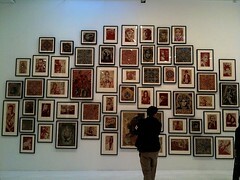 Secondly, a collection of related pieces of art is far more valuable than a random collection. You'll get more enjoyment out of becoming an expert on your chosen niche of the art world too. Don't be random. Choose a theme for your collection, it doesn't matter what it is as long as it's something you're interested in. Local artists or surreal artists, landscapes or cartoons, oil paintings or stencils, there are many ways that you could choose to do this. Remember, there is more financial and enjoyment value this way. You might want to write down what your collecting theme is to help keep you on track for when you find art that you love that doesn't fit with your theme. Just a suggestion. Thirdly, you also may want to take into consideration your living environment. In that, humid or coldly damp places and works on paper are not a good match (add insects and direct sunlight to that list), bronze sculptures are almost indestructable which is useful for bushfire zones, massive sized artworks don't fit in apartments and if you have a colourfully decorated home the art you choose may need to fit your home colour scheme. If you are worried about an artwork fitting in with a change in decor, remember that like a good piece of furniture, a good artwork will transfer just fine into a different residence. Where to find the art you want and can afford. The primary art market means buying direct from artists or via galleries representing an artist. This is the cheapest way to start your collection, with artist direct being the most hip pocket friendly. Generally, the less well known the artist, the lower the price of the work. You can find artists online, artists selling direct from their studio and artists selling via exhibitions in both commercial and artist run galleries. There will be publications in your area listing all the latest exhibitions. Visit and view. Get on the mailing lists of artists and galleries that you like so you find out about new works and shows first. The secondary art market means buying from other art collectors. Usually an art dealer or gallery is involved. Art auctions are another form of the secondary market. If you are buying via auction, remember that there are cycles in fashionability in the art world. This affects auction prices significantly. What's not in fashion is cheaper to buy. An artwork with a signature on the front is more valuable than a similar piece with a signature hidden on the back or missing a signature altogether. Oil on canvas has traditionally been seen to be the most valuable of art mediums, but this is changing with so many more materials available to artists and more knowledgable conservation techniques. Go with what you love. You'll be looking at it for a long time.